For me, this time of year is always filled with anticipation. As the summer draws to a close (still in denial even though I technically don’t have a “summer” anymore) we’re left in this strange in between… football, fire-side hangouts and the holidays are right ahead, but just out of reach. Even though it’s not here yet, I hope you don’t mind if I bring some fall-inspired looks to the blog in the coming weeks! We’ve still got plenty of time to bust out the sundresses and tank tops, but consider this a little “sneak peek” into fall fashion this year. And, I should add, each time you see me “bundled up” in one of these “sneak peeks”… rest assured, underneath those forced candid shots is an incredibly overheated, probably unlawfully sweaty Kate. 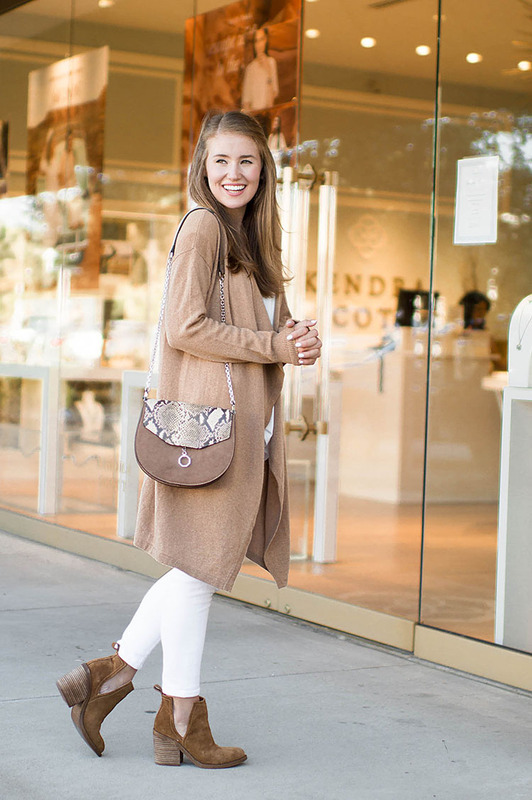 Let’s start out with one of my favorite color combinations for transitioning from summer to fall… white and caramel! I snatched up this cashmere (!!!) cardigan at quite the discount during the Nordstrom Anniversary Sale, and can already tell you that it’s seen it’s fair share of wear during early, chilly mornings at my apartment. (Am I the only one who cranks the AC at night?) 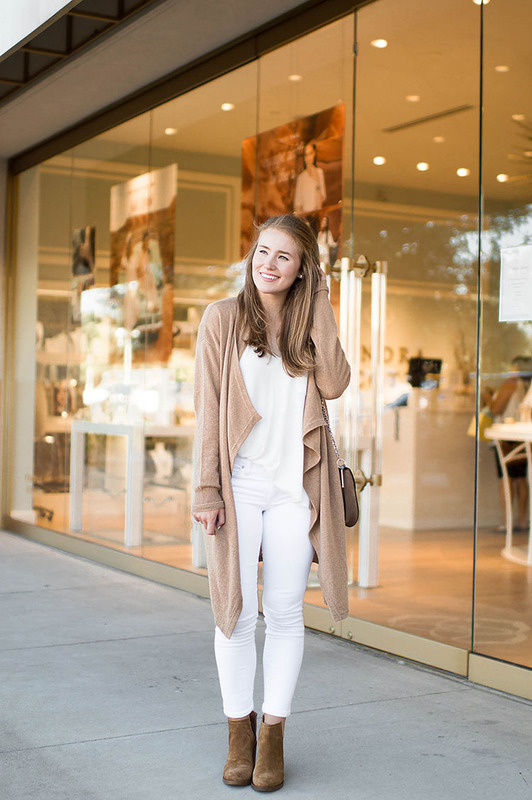 The fab thing about this cardigan is it comes in four colors as well as petite sizes! 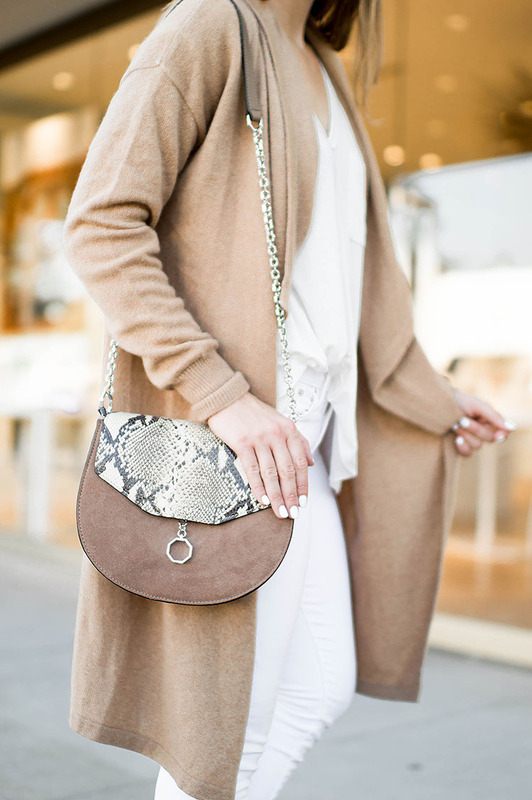 Definitely a piece worth splurging on, as it will be your favorite go-to this fall. Another piece I’m loving in this ensemble? These fun, cut-out booties! At first, I was skeptical… cut outs? In booties? What? They were too cute and different to say no to, and the second they shipped to my door I knew I’d made a great decision! 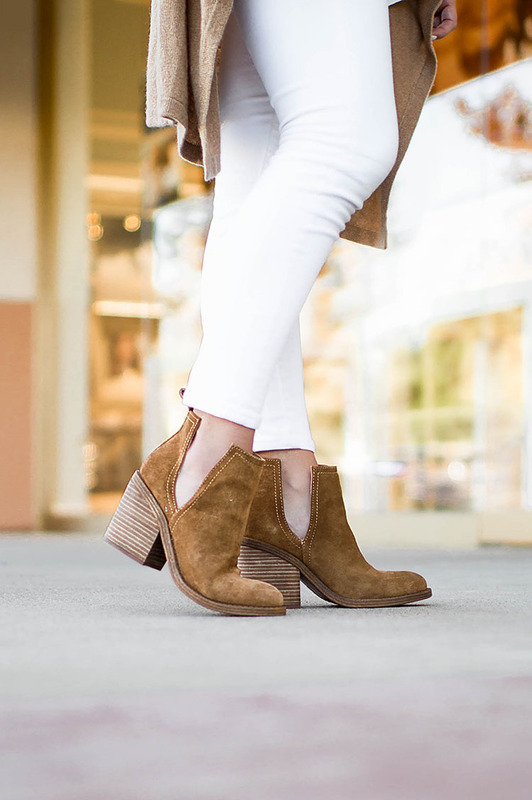 They are the perfect bootie to take you from summer to fall. They’re also really elongating – always a plus for us short girls. 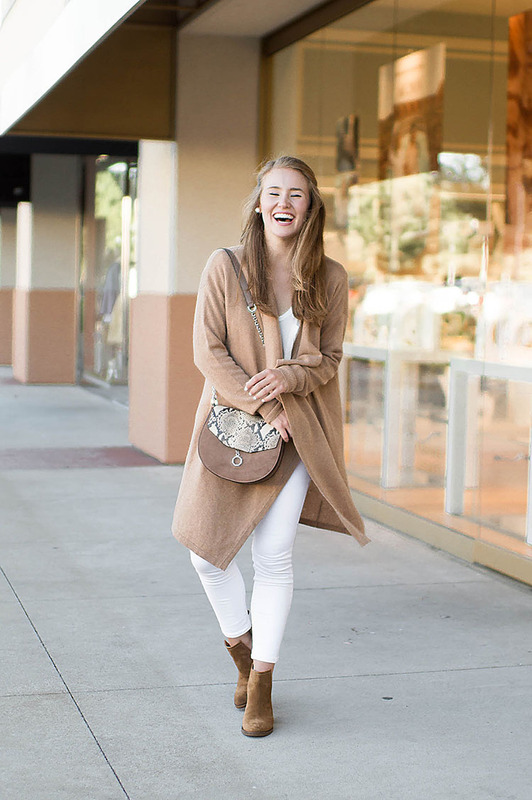 This cozy ensemble is quite the transition from my week by the sea, but I have to say that I’m not hating it! Before I sign off, I’d love to hear how you feel about seeing a few fall looks in the coming weeks. Yay? Nay? Any other ideas or recommendations for what you’d like to see around here? As always, I’m all ears! I love this light look for the fall it looks so pretty and cozy! Ohhhhh that cardigan is perfection !!! Adorable outfit! Love this color combination. Loving that cardigan on you! It looks so cozy! Oh yes – super excited for fall so bring on the inspiration! Girl you killed it with this fall look! So light and simple – love it! Would definitely love to see some fall posts to start building up my wardrobe! I love how you used the caramel as your pop of color! How fun and fall like! Loving this look for fall! 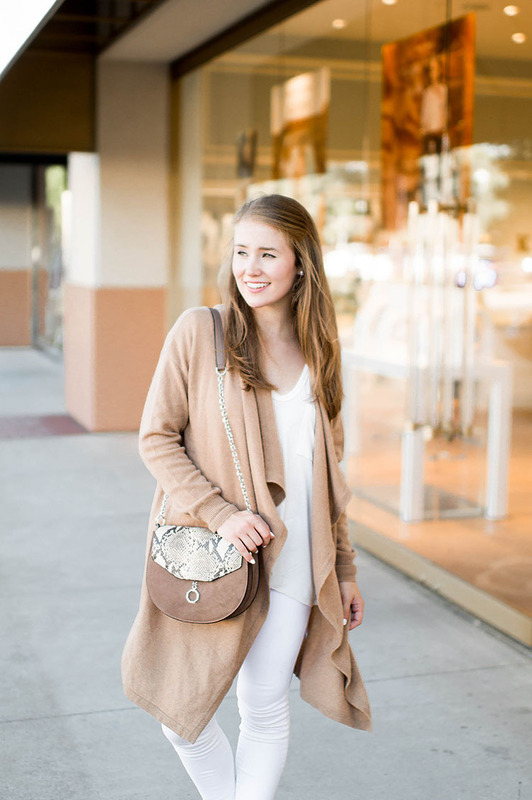 Your cardigan is absolutely stunning – love the way it drapes in the front! I would love to see a tutorial on using your uptown girl makeup! Step by Step would be awesome! So cute! I got the same booties from the Nordi sale. Have you figured out a type of sock to wear with them or is no sock the only option? I love this outfit! I’ll have to store the inspiration until late November though; it’s not going to cool down for me until thanksgiving. I’ve been loving how you’ve been styling your hair lately… tutorial? Do you have a favorite airplane/travel tote- I’ve done the whole Longchamp thing and I have a Tory burch small York right now but its too small for air travel. Would love your suggestions for a stylish tote!